It can be difficult to find the white, black and red veneers needed for segmented turning. The Bowl Kit Co. has packaged 8" x 9" pieces of .024" (just under 1/32") veneer together ready for use in your next project. The Black and White packs contain 4 square ft. per pack. The Red contains 2 square ft. 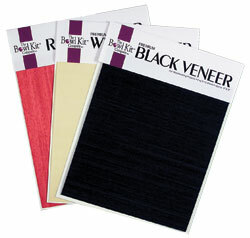 The Combo Pack of 3 colors has 3 square ft.